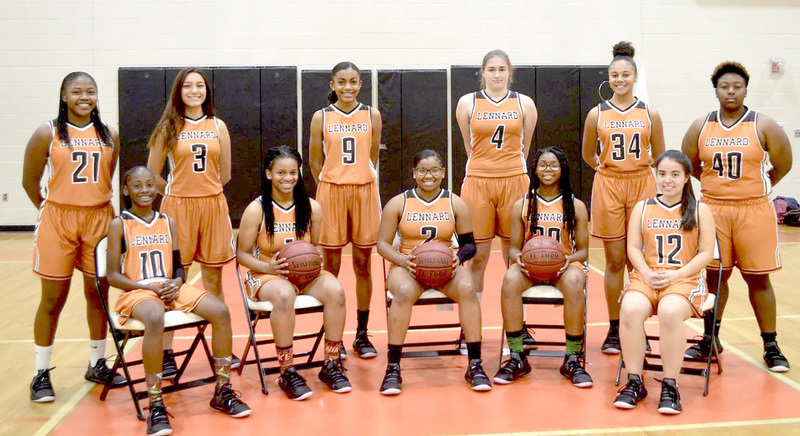 LENNARD LONGHORNS 2018-19, seated from left: Mara Johnson, Mikaila Harrison, Latevia Hall, Halei Murrell, Cassandra Rancourt. Standing: Imani McFarland, Nataliah Ponce, Nicolette Wray, Hannah Feurbach, Mattiana Wells and Andreya Okwusaba. RUSKIN — The Lennard Longhorn girls basketball team has home games Dec. 5 with Strawberry Crest and Dec. 7 with Plant City after a Dec. 4 game in Tampa with Jefferson. The Longhorns are looking to get back on the victory track after opening the season with a 32 -27 win over St. Stephens. Since then, the girls have lost three straight, the most recent last Friday against Spoto 55-50. “The Spoto game was very physical,” said Coach Jerome McWhorter. “We started off slow after trying to adjust to their length and size. Spoto jumped out to a 17-10 lead after one quarter and a 28-22 halftime lead. The Longhorns fought back with a 20-point outburst in the third quarter to take a 42-41 lead. But McWhorter’s offense scored only 8 in the final quarter with Spoto putting up 14 final points in the last stanza for the win. Lennard’s Latevia Hall, a senior, led the scoring for the Longhorns, throwing in 17 points, with 4 of 6 from beyond the arc. Freshman Halei Murrell scored 13, and junior Mikaila Harrison added 12 points from her guard position to go along with 7 rebounds, 2 assists and 2 steals. Sophomore Imani McFarland did not score but contributed 9 rebounds and 2 steals. McWhorter started coaching basketball in Polk County at Lake Region High School in Eagle Lake. His job was head girls JV basketball coach and the Varsity assistant coach. McWhorter held that position for five years and then became head JV boys basketball coach for Lake Region for another 5 years. That was two years ago when McWhorter moved to Hillsborough County at Lennard High School to assume the duties of head girls Varsity basketball coach in charge of all Girls Basketball Operations. McWhorter has been coaching high school basketball for a total of 11 years, having served one year at Lennard, finishing with a record of 11- 8 in 2017-18 and coming in third place in 8A District 9. McWhorter is presently going into his second year as the head varsity coach with the Lady Longhorns. At Lennard High, McWhorter is also the Credit Recovery instructor. McWhorter attended Hardee County Senior High School, home of the Fighting Wildcats, in Wauchula, Fla. where he played basketball and then went on to attend college at Bethune Cookman University, where he obtained a degree in Education and a minor in Business Management. McWhorter is working on the mental as well as the physical parts of the game with a young squad. “This year our expectations are to have a ‘No Cap Thinking’ process as our mindsets are to be determined, focused, and patient and to understand that we are our biggest opponent,” he points out. “Our style of play will be — as always — very physical and attention to details,” said McWhorter.